China must adopt a more aggressive volumetric pricing programme, however, to manage demand, particularly for industrial users. On a per cubic meter basis, water tariffs on businesses and individuals are less than 12 percent those in Denmark and less than half of those in the developed world. China’s implicit subsidisation of water serves little purpose, least of all in prompting conservation and innovation. China has made some efforts to address these challenges. The sponge-cities programme, a modified version of low-impact development that focuses on permeable surfaces and water infrastructure, seeks to increase groundwater absorption. The central government has set a target for 80 percent of Chinese cities to meet sponge-city standards by 2030. This is a crucial step in aggressively addressing groundwater depletion in urban areas, including Beijing. However, there appears to be a tepid appetite for private investment in these projects. More aggressive inducements are needed to prompt public-private partnerships for sponge-city development. 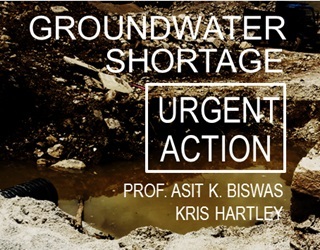 Addressing the groundwater depletion problem－and in broader measure the growing crisis of water scarcity amid rapid urbanisation－will require a multi-pronged approach that includes unequivocal political will, transparency regarding the impacts and costs of depletion, creative policy initiatives to manage demand, and support for technical innovations to improve usage efficiency. Both China’s economic and environmental sustainability are at stake. Kris Hartley is a Singapore-based researcher and consultant focusing on economic development, public policy, and urbanization. With a decade of public and private sector experience, he has consulted on a variety of topics including earthquake recovery, financial regulation, infrastructure asset management, and nuclear energy policy. Working on solutions with high economic and social impact, Kris is currently conducting research about urban revitalization and cultural preservation in Singapore, provincial governance and economic competitiveness in Vietnam, and water resource management in the Hong Kong region. Kris is also a Ph.D. candidate at the Lee Kuan Yew School of Public Policy at the National University of Singapore, where he holds the President’s Graduate Fellowship. His education includes a Master of City Planning in Economic Development from the University of California, Berkeley, an MBA with a focus in International Management from Baylor University, and a BA in Classics from the University of Tennessee.